Something for everyone ~ from Nashville, Indiana! 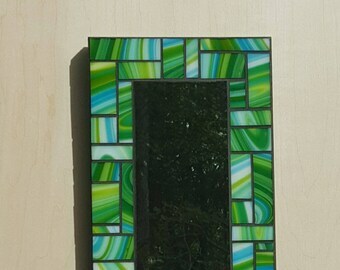 Original freehand drawing by DeMaris - black and white - 8 x 10 minimalist modern contemporary home decor - bold designs - "Life Cycle"
Funky green and white swirled stained glass mosaic mirror made with Spectrum glass, 8"x 14" accent mirror handmade unique free shipping! Announcement Welcome to my gallery! Here you will find many interesting and original works of art, as well as jewelry in a variety of mediums. I have been working with stained glass since 1995, and since then I have been selling my artwork at fine art and craft fairs all over the Midwest, and in galleries. My art decorates homes and businesses around the world! Though stained glass was really my first love, I'm just not content with only one creative outlet. I love simple shapes, forms, and designs, and sometimes I'm frustrated that I can't create stained glass panels that are true to my drawings because it would require too many cuts and solder lines. I have always loved the beauty and texture of natural wood, and have recently discovered much joy and satisfaction through the process of transferring my designs onto wood panels with pyrography (a fancy name for arming myself with a wood burner!) and finishing them with the rich and velvety color of Prismacolor pencils. The effect is perfect - the color is very bold, but the beauty of the wood grain isn't lost, as it would be with traditional painting methods. 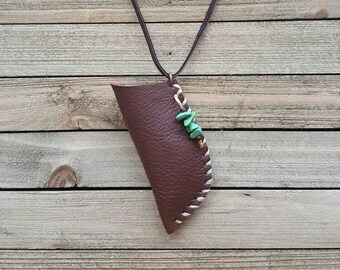 I also love to make jewelry from recycled materials, such as my scrap glass, plastic milk jugs, paint chips, leather, even tree branches! You never know what new goodies you might find here, so stop by often. Add me to your favorites and to your circle so you’ll see my new listings on your feed. You can even visit and "like" my Facebook page, Mud Horse Art, to browse through many galleries of my work - past and present - to get an idea of what I can make for you! 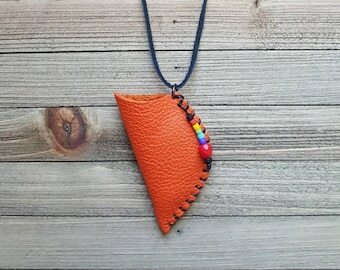 If you like what you see, but would like a different size or color, I am always happy to do custom work. Please contact me with any questions or for a price quote. Above prices do not include shipping. Galleries: Contact me for wholesale pricing! Welcome to my gallery! Here you will find many interesting and original works of art, as well as jewelry in a variety of mediums. 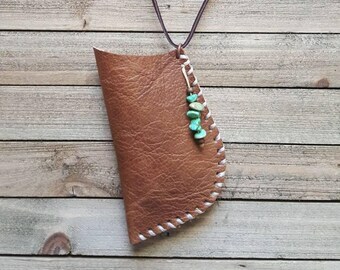 Honey brown leather pouch amulet bag upcycled leather recycled leather Native American inspired jewelry necklace with real turquoise bead. 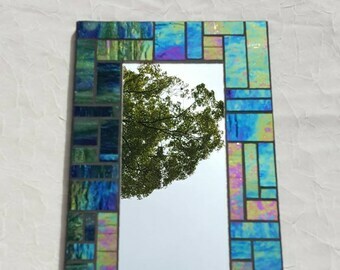 Stained glass mosaic mirror made with Kokomo iridescent glass, 8" x 13.75" accent mirror wall mirror small mirrors, handmade free shipping! 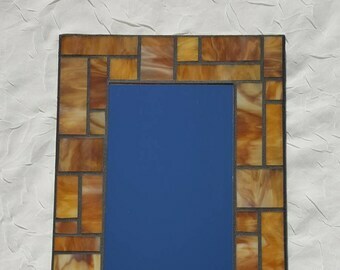 Butterscotch brown stained glass mosaic mirror 7.5" x 12" handmade accent mirror earth tones neutral color, customize this! Free shipping! 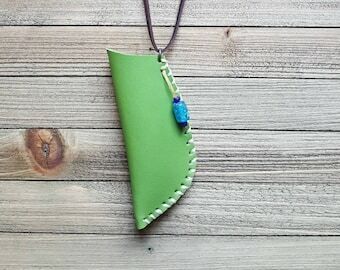 Stained glass jewelry, necklace, blue and aqua pendant necklace, reversible, unique jewelry, long necklace, free shipping! Red stained glass necklace, red pendant, glass, long necklace, reversible adjustable unique one of a kind jewelry with free shipping! 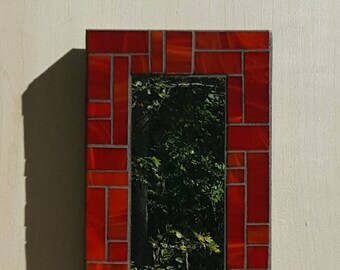 Red stained glass mosaic mirror, made with Spectrum glass, 6.5" x 12" small accent mirror, custom size available, free shipping! 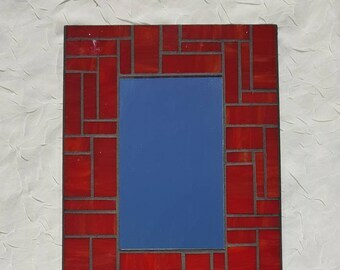 Mosaic mirror red stained glass mosaic mirror 8" x 11" handmade accent mirror small wall mirror one of a kind! Customizable! Free shipping! 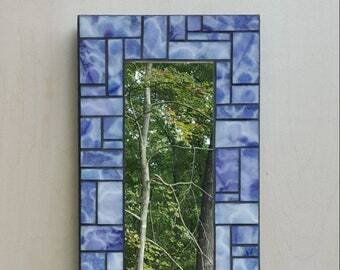 8" x 14" lavender blue violet stained glass mosaic mirror, accent mirror, one of a kind, handmade, Uroboros glass, free shipping! Mustard brown stained glass mosaic mirror made with Uroboros glass, 8" x 16" handmade accent mirror wall mirror mottled glass free shipping! 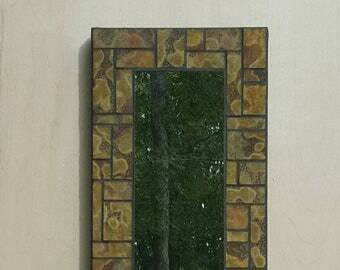 Mottled yellow-green stained glass mosaic mirror 8" x 15.75" handmade one of a kind free shipping! 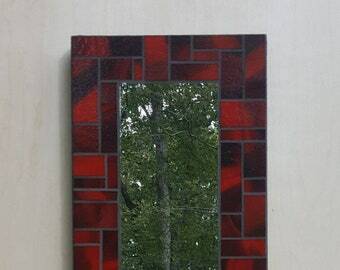 Red and black mosaic mirror made with Bullseye stained glass, 8" x 15" handmade accent mirror one of a kind free shipping! 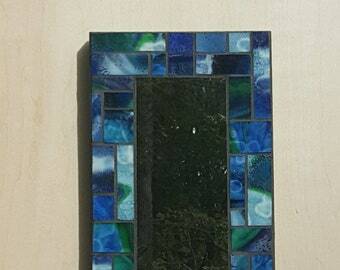 Navy blue stained glass mosaic mirror, accent mirror, 8" x 14" handmade mosaic mirror, home decor, free shipping! 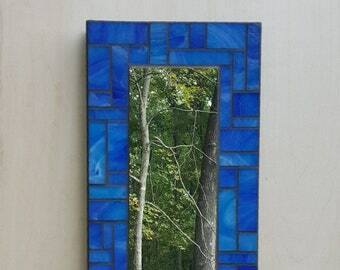 8" x 14" blue mosaic mirror, stained glass mosaic mirror, accent mirror, wall mirror, handmade wedding gift, one of a kind, free shipping! 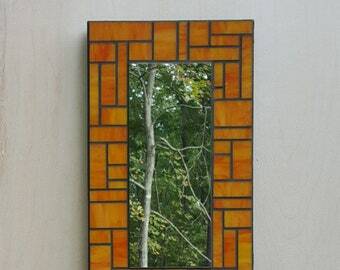 8" x 14" orange stained glass mosaic mirror, mosaic accent mirror, handmade, one of a kind, free shipping! Love the earrings & love that you made them from recycling plastic materials!! The mirror arrived in great shape. Shipping time was fast and DeMaris was great throughout the transaction. It’s very well made and looks great In my home. Highly recommend. Sunshine Yellow Stained Glass Mosaic Mirror with Bullseye and Uroboros Glass 11.75" x 15.75"
The art of pyrography in progress...and all my pretty Prismacolor pencils. 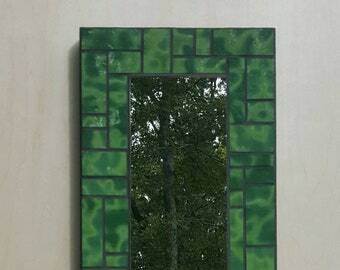 This is me grouting a custom mosaic mirror. 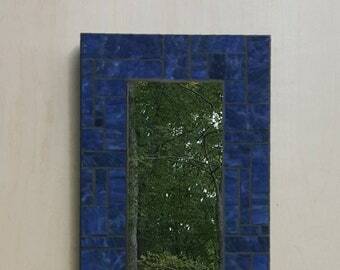 A finished mosaic mirror. This one found a lovely home in Germany! "Happyman." Yes, it's true I cried when I sold this piece! But he found a very loving home, indeed! Since 1995, after studying art education at the Herron School of Art in Indianapolis, Indiana, I have spent almost two decades creating art for homes, businesses, hotels and restaurants. I have enjoyed many summers of travel throughout the Midwest to display and sell my artwork at fine art fairs and galleries. Though stained glass and mosaics have been my focus for many of these years, the solder lines or grout seams that are inherent in stained glass production often compete with my original abstract designs. This has led to an exciting and necessary evolution, whereby I transfer my designs onto solid wood panels using a wood burning tool (also known as pyrography). To complete my unique process, I apply the rich and velvety color of Prismacolor pencils. The effect is brilliant! The color is very bold, and the beauty of the wood grain is greatly enhanced. My inspiration is limitless. I see potential designs in arbitrary places, like cracks in the sidewalk or a splash of red wine on a white tablecloth. Nature is an eternal source of inspiration, and I often take design cues from interesting accidents, such as the pattern of tree branches woven together in a silhouette, or the amazing organic flow of hundreds of starlings bound together in flight (known as murmuration). It’s tempting to conjure up a fancy story about why I create the kind of art I do, but I simply love to draw shapes, forms and lines that are pleasing to my eye, and hope it’s pleasing to the beholder as well. And because I'm always evolving, in 2014 I developed a new line of artwork. I create original freehand drawings with Micron pens and Faber-Castell markers. These are NOT prints! Each drawing is totally unique. I don't use any patterns or rulers. I just sit down, put pen to paper and wait for the abstract image to appear! I live in Fishers, Indiana with my husband, Paul, and our two boys, Isaac and Will. I love to listen to books on CD as I work in my studio and daydream about becoming as famous as Picasso or Andy Warhol. My favorite artists are Andrew Wyeth and Edward Hopper. I love poetry, but only the good stuff that isn’t so abstract I can’t understand it. Abstraction better lends itself to visual art, I think. Stephen Dunn is my favorite poet. He’s said just about anything that can be said about the inner workings of the heart and mind. My favorite novel is Atonement by Ian McEwan. My all time favorite band is The Cure. I love science, and anything that relates to how the mind works. I don’t believe in the supernatural. If I could meet anyone in the world, it would be the evolutionary biologist Richard Dawkins. If you don’t buy my art, buy one of his books. It will change your life, or it will really upset you – one of the two! My favorite thing to do is go hiking and camping. My favorite food is so common, I’ll keep you in suspense (It starts with a P). I prefer chocolate to vanilla. Green is my favorite color. I have an aversion to planning or scheduling of any kind, and I live for spontaneous adventures! Telephone conversations make me anxious, and I avoid them at almost all cost. I had a happy childhood. I’m having a pretty fantastic adulthood. I have every intention of seeing my 100th birthday, after which I will happily relinquish my guts to the future of medicine. Hello! Thanks for visiting my Etsy store. 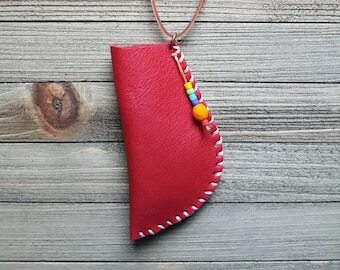 My goal is to make quality handmade products that are affordable and made to be enjoyed for years to come. If you aren't happy with your purchase, then I'm not happy! I want you to be satisfied, and I will be happy to do an exchange if you notify me within seven days with the news that you find yourself suffering from buyers remorse! In the event of an exchange, it is the responsibility of the customer to ship the item back to me as well as cover the shipping of the new item. For custom work there are no refunds, and exchanges are not guaranteed. Each case will be considered individually. Because I work with glass and wood (materials that are not mass produced) there are often variations in the glass color and wood grain that are beyond my control. For example, two sheets of swirly blue and white glass might have the same ID number, which means they have the same amount of blue and white added to mix, but they might vary in appearance due to the way the glass was poured onto the table during creation. One sheet might have a very even distribution of the colors, while the other might be heavily blue on one side and very white on the other. When I order glass for custom work, there is always a slight risk it won't be an exact match to something you might have seen on my Etsy pages. If the discrepancy seems great, I will let you know before I begin work. I require a 50% deposit for all custom work. The balance plus the shipping costs must be paid before item is shipped. I use FedEx unless you prefer a different carrier. I am not responsible for any loss or damage once the item purchased has been shipped. 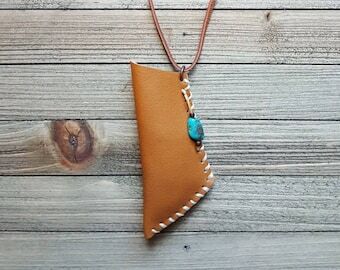 I accept PayPal and credit cards through Etsy checkout. All art must be paid for in full before I ship it out. All of my shipping prices are for within the United States. I am happy to ship out of the country or overseas, but please contact me before you make a purchase so I can calculate and re-post the shipping. All items over $50 include insurance, but I am not responsible for any loss or damage once the item purchased has left my hands. If the item is damaged or broken and the carrier (FedEx, USPS, or UPS) denies the insurance claim (this has happened once in Feb. 2015) I will try to repair the item, but the buyer is responsible for the second shipping. 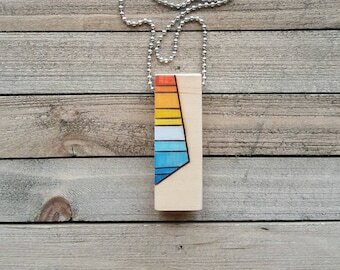 I welcome all custom orders and am always happy to talk with galleries about wholesale pricing.